Travel back in time to Ancient Egypt with Pharoah, an Egyptian themed slot create by Inspired Gaming. Fascinated by the history of Egypt? Many centuries ago, Pharaohs ruled the land and decided the fate of Egypt. Pharaoh is a 5 reel, 20 payline slot with beautiful 3D cartoon graphics and a regal design that's fit for a king. This slot has various rewarding features and hidden treasures including bonuses, jackpots, free spins, and mini-games. There are lots to try and play new online slots today! Don't forget to check out our slot games online. If you're fascinated about Ancient Eygpt or want to know what it's like to be a pharaoh, then you'll love Pharoah on Wizardslots.com. 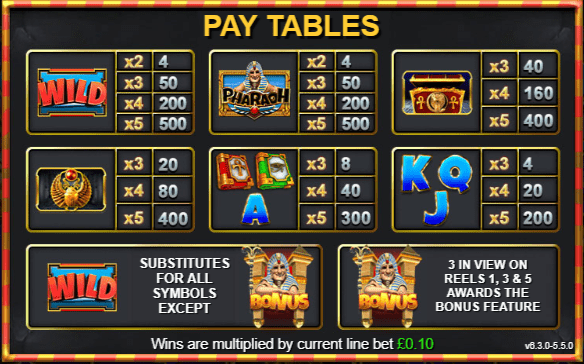 Pharaoh is a 5 reel, 20 payline slot with an Ancient Egyptian theme. The design is excellently done bursting with bright colours and funny 3D animations. From time to time, you'll notice Tutankhamun dancing across the screen to an Egyptian themed soundtrack which is quite funny. Behind the reels, you'll see a beautiful Egyptian scene filled with blue skies and tall sandy pyramids. Who knows what could be inside? The symbols all fit Egyptian theme and include the eye of Ra, ankh cross, ancient books, a big treasure chest, Tutankhamun and blue playing card symbols. It's no surprise if this game is already among the top 10 online slot today! Bonuses and Jackpots - Land 3 bonus symbols anywhere on the reels to activate the bonus game. Once unlocked, you'll be whisked away to a map of Egypt where you have to roll the dice in order to unlock one of three unique features. Each feature begins with a free spins mode that includes a fun mini wheel game. Here you will see how many free spins and multipliers you will gain. You'll also see if any of the low-value symbols will be substituted by wilds. The Wild Symbol - The wild symbol in this slot is the blue 'WILD' and replaces all other symbols on the reels to form winning combinations. Landing 2 or more wilds will award you with a cash prize. 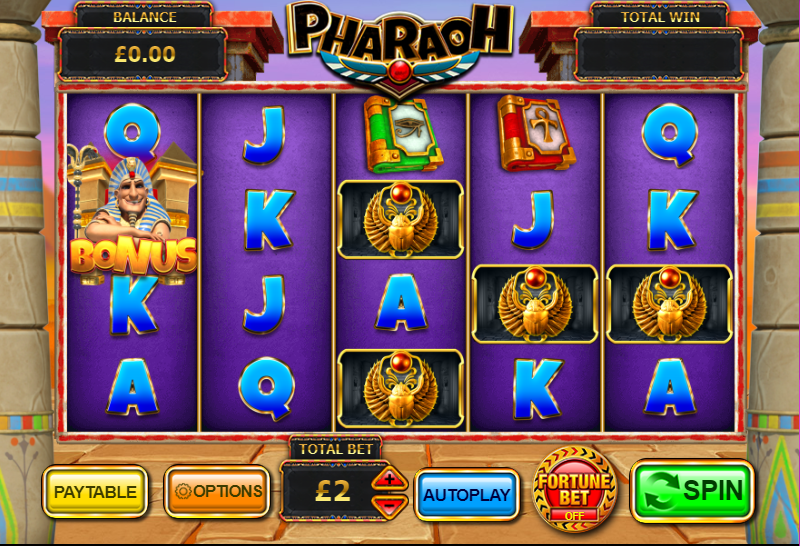 Pharaoh Wild Spins - There are a few fun mini-games in this slot including pharaoh wild spins. As you may have already guessed, there are lots of chances to win free spins here. With every spin, 2 extra wilds will be added to the reels to create bigger and better winning combinations. Pyramid of Prizes - Another fun mini-game is the pyramid of prizes. In this game, all you have to do is climb the stairs to the top of the pyramid. The higher you climb, the bigger the prizes you will get. If you're lucky enough to make it to the top, you'll receive another bonus round of free spins. If you are looking for an Egyptian adventure filled with mystery and treasure, then you have come to the right place. The 3D animations are great and the funky soundtrack will have you walking like an Egyptian. There are lots of fun mini-games with Pharoah with prizes of up to 500x your total stake on offer. Or hop over to Frog of Fortune.